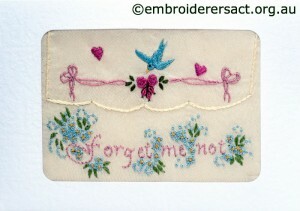 Well after the last post which was super long here’s a very quick one. 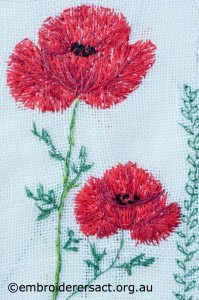 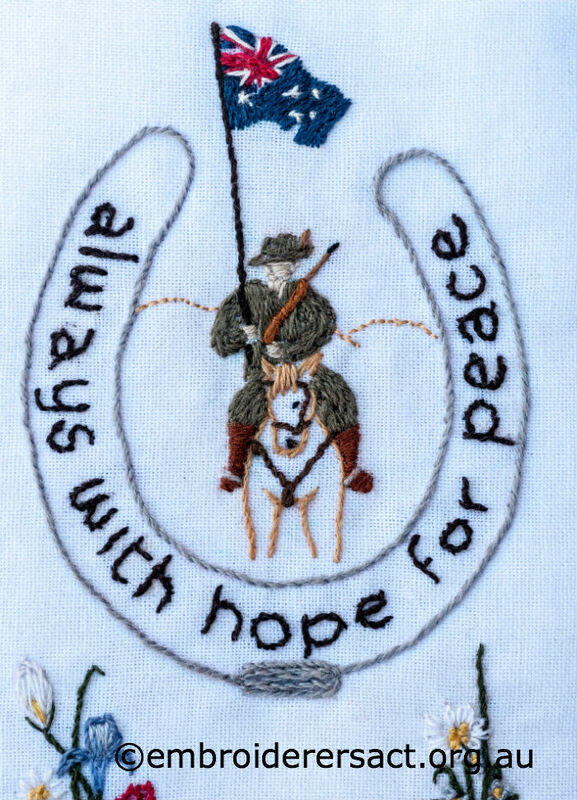 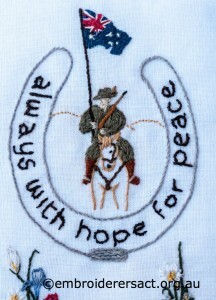 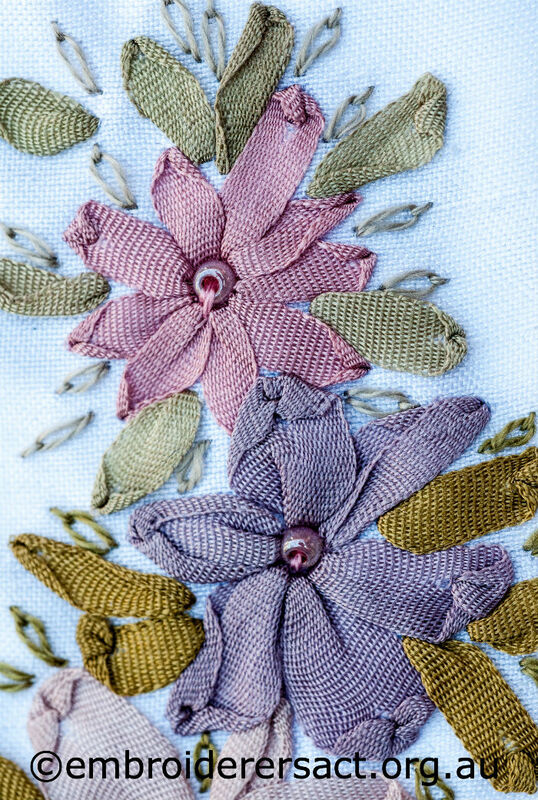 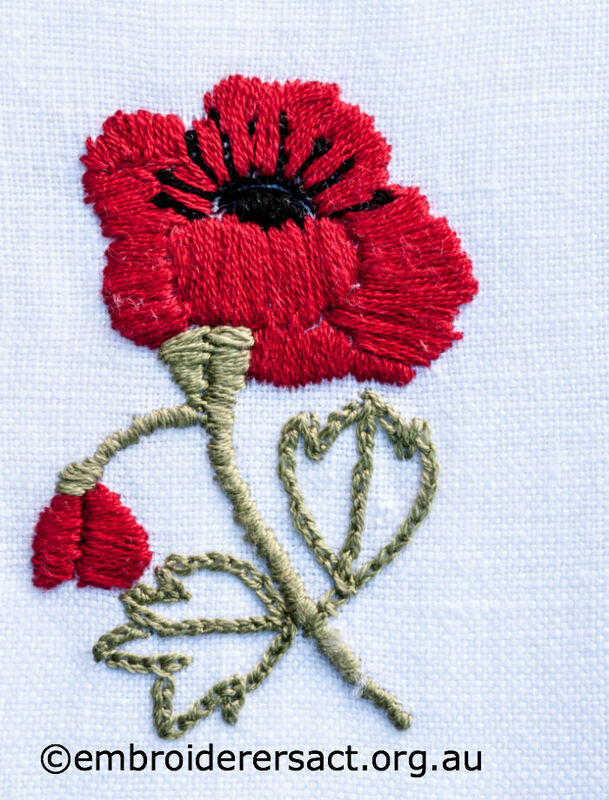 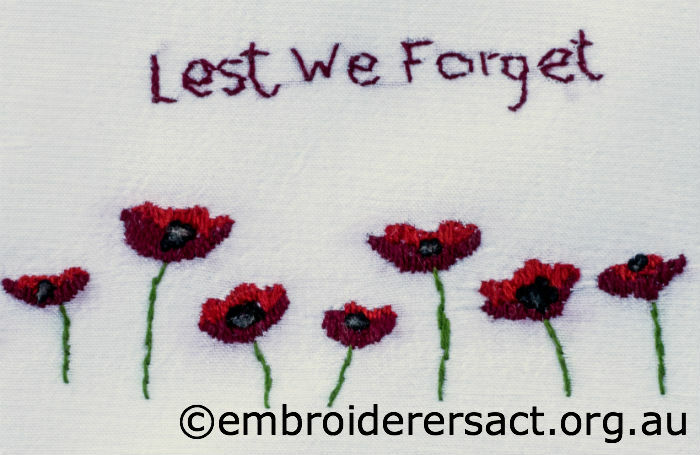 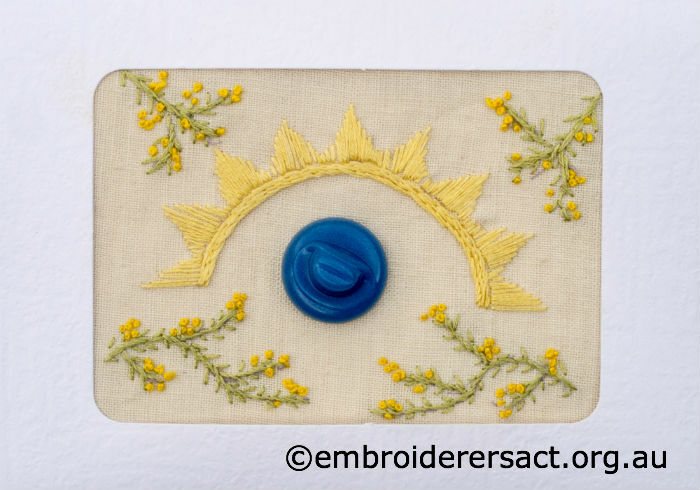 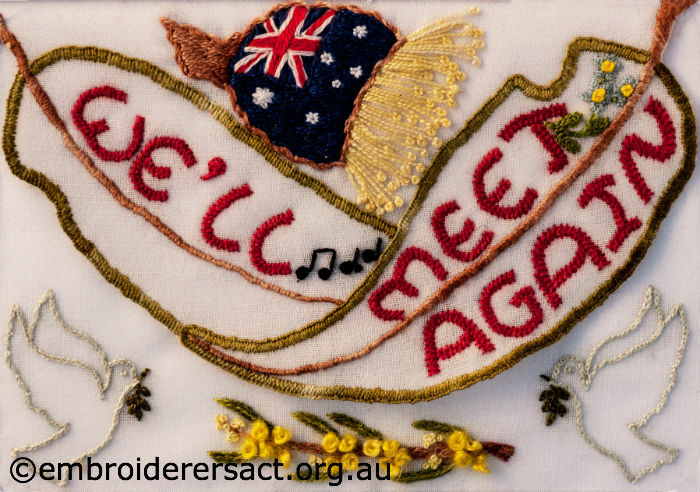 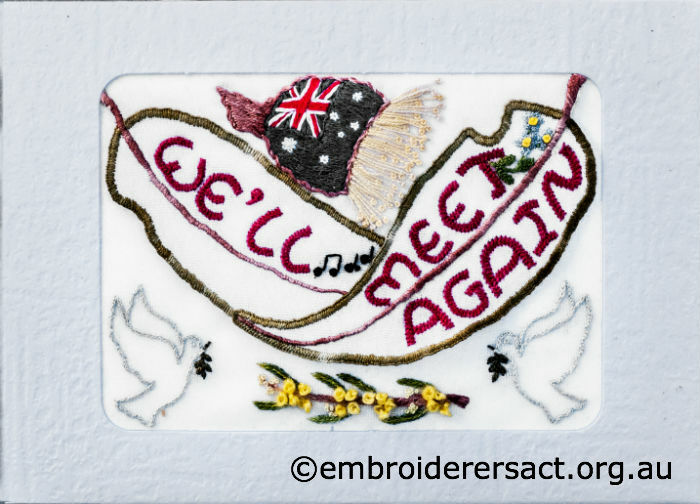 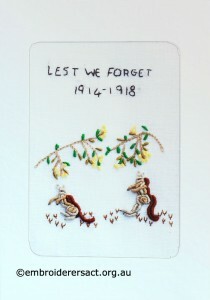 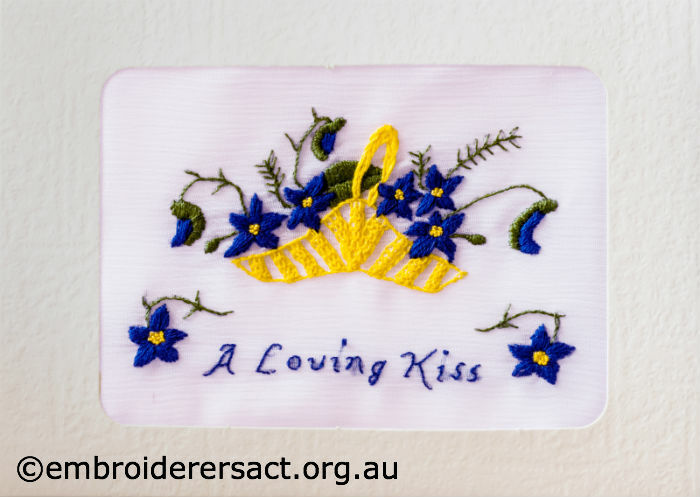 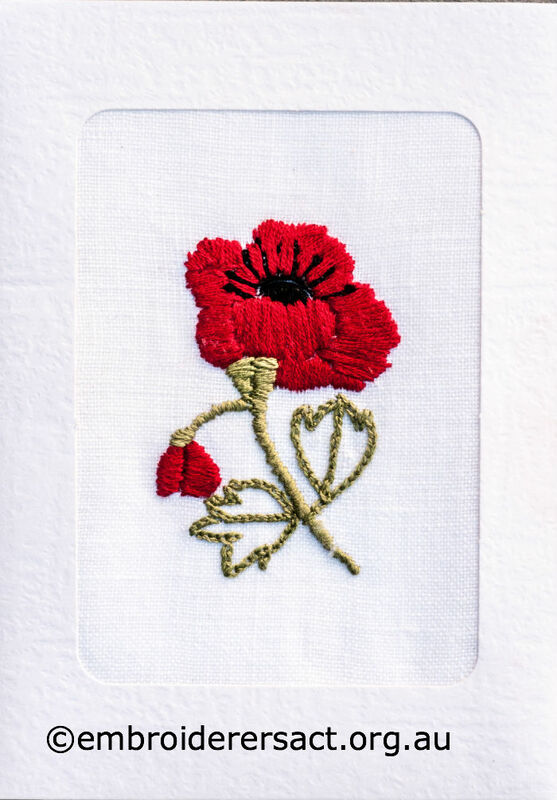 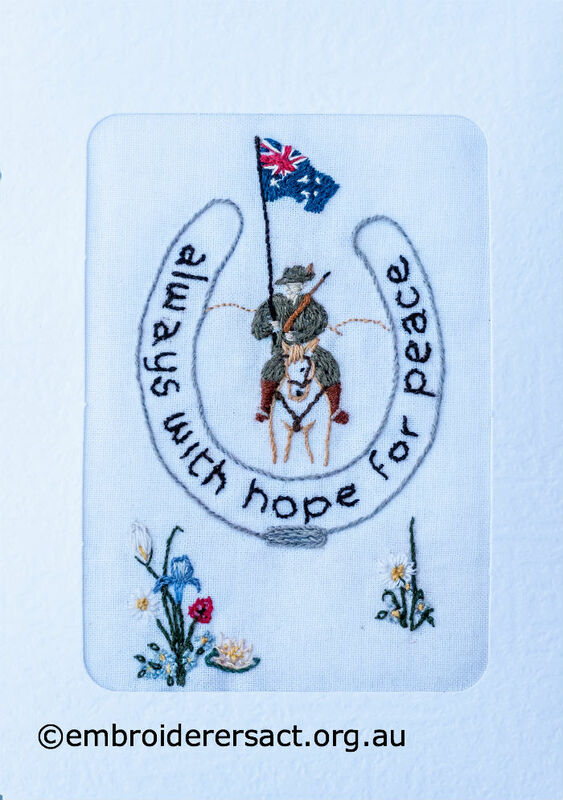 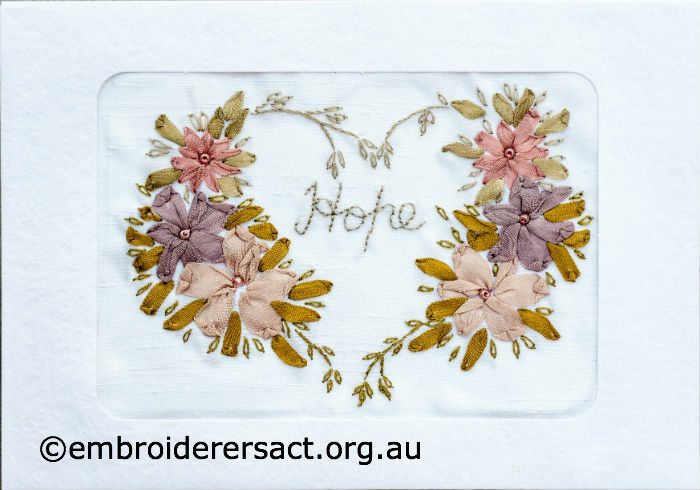 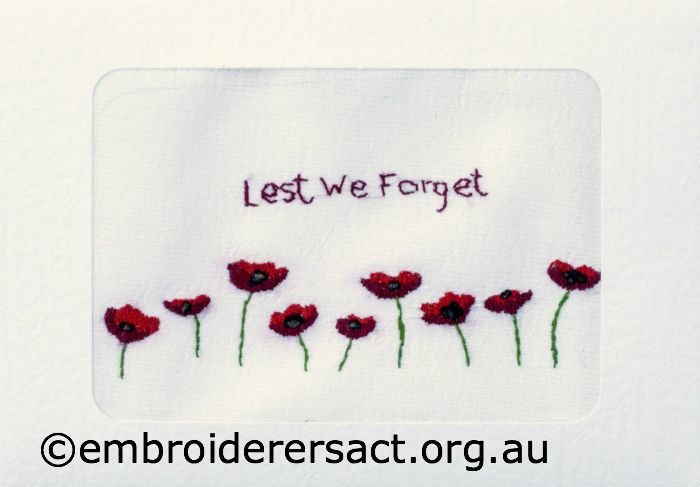 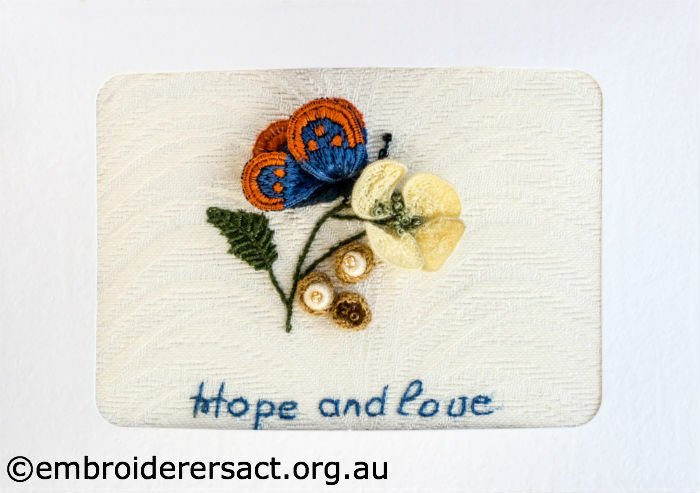 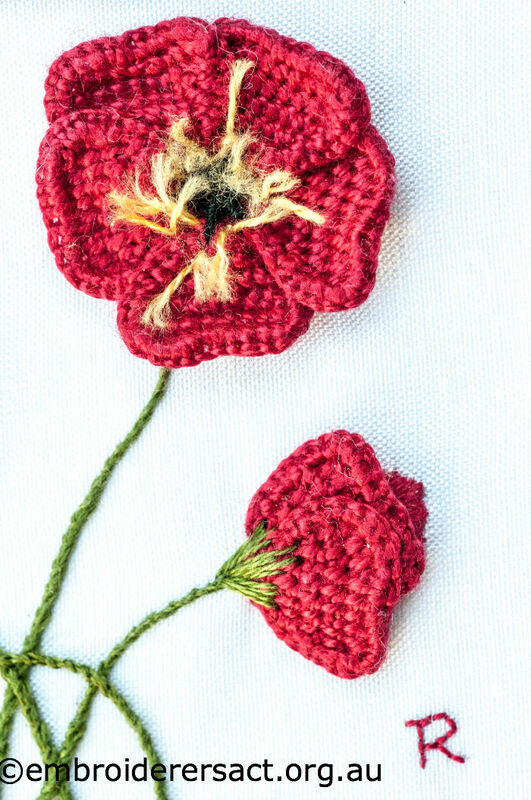 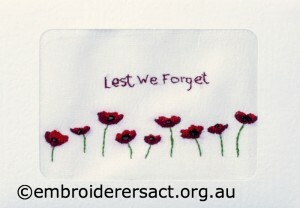 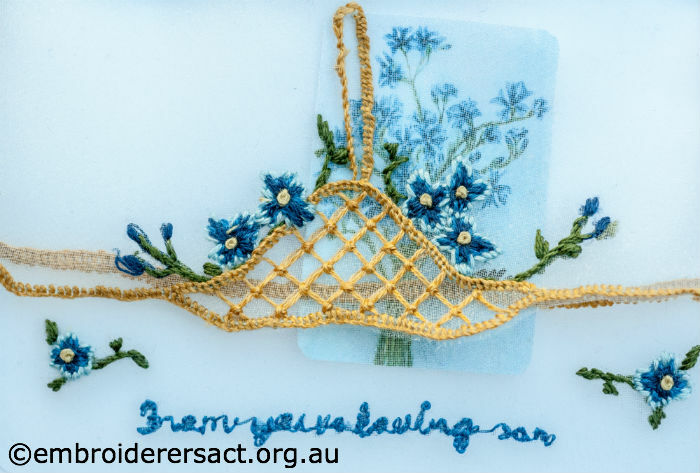 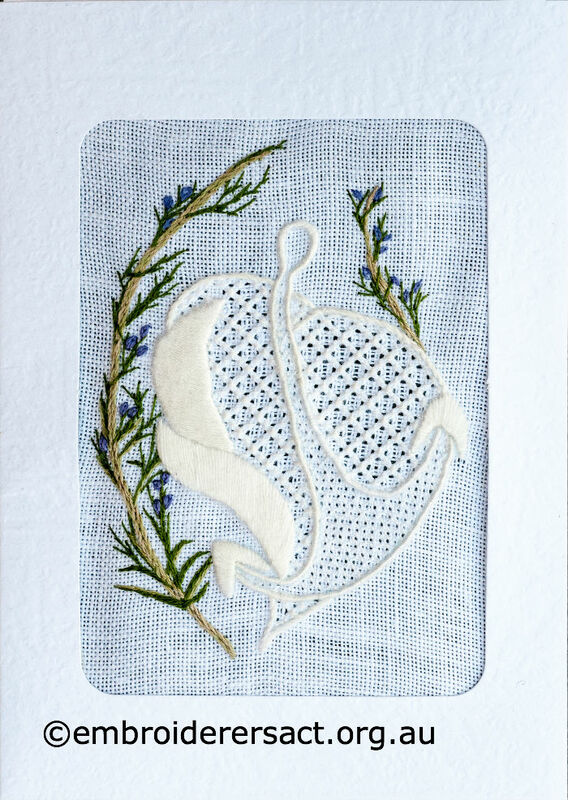 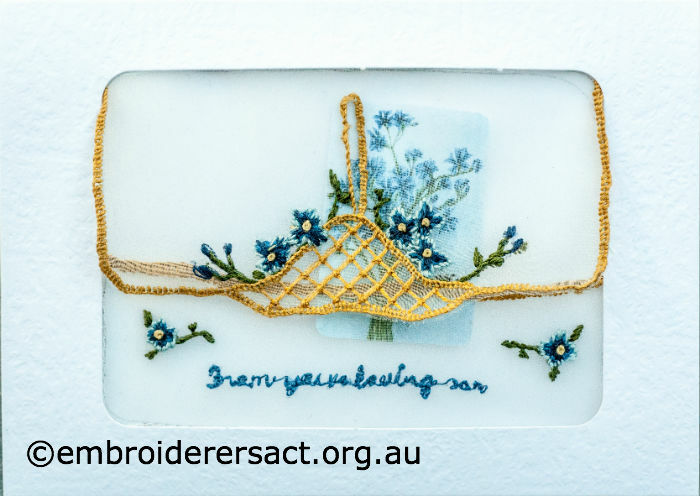 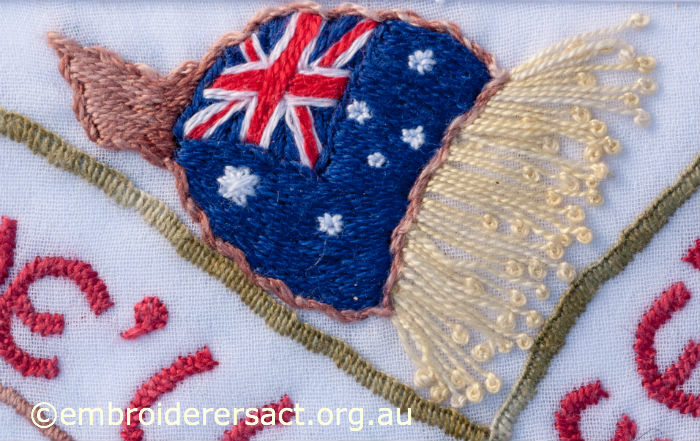 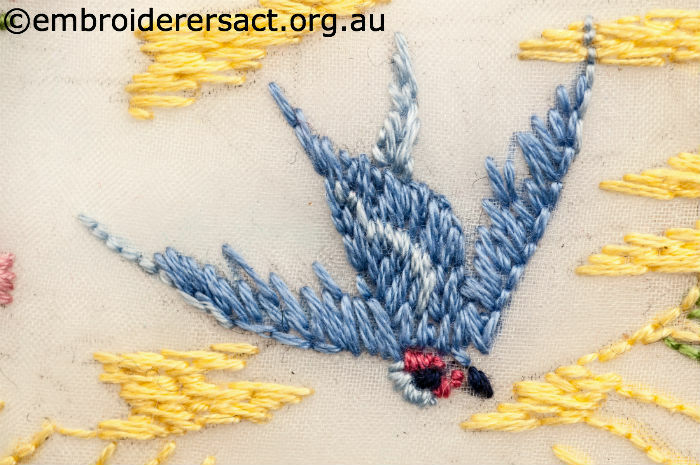 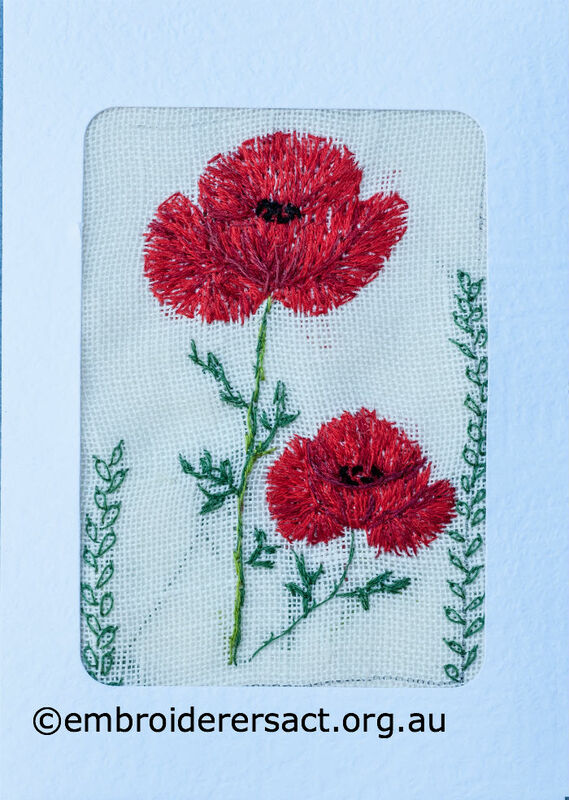 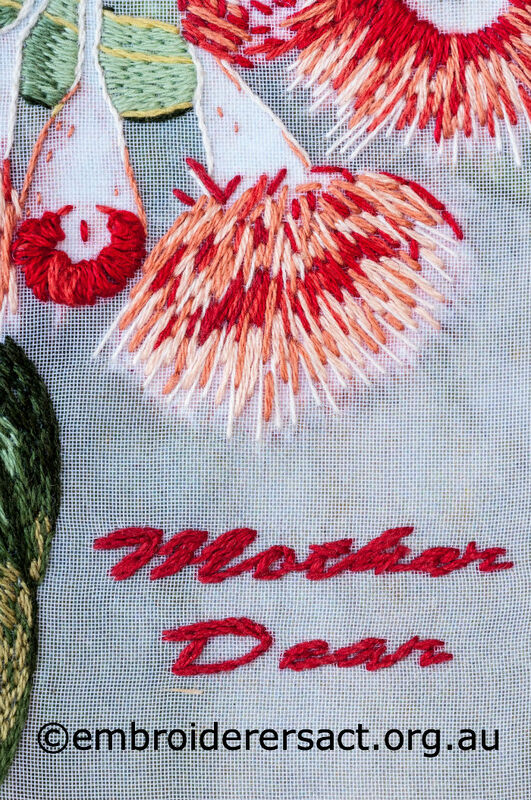 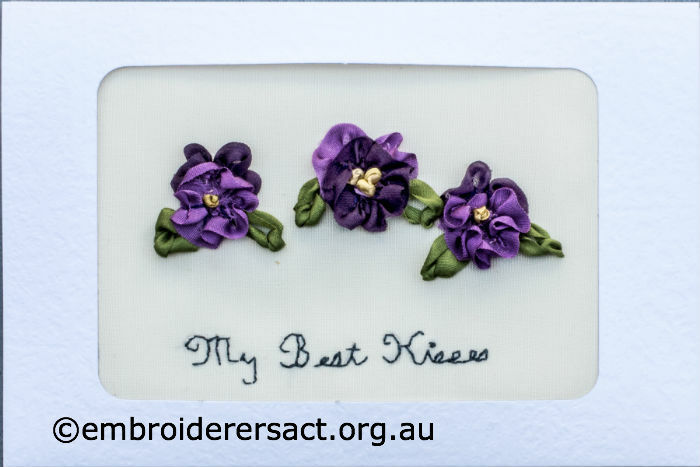 In this post we’re sharing a wonderful postcard from the 2014 Creative Challenge Stitching Love and Hope to re-interpret WW1 Silk Postcards. 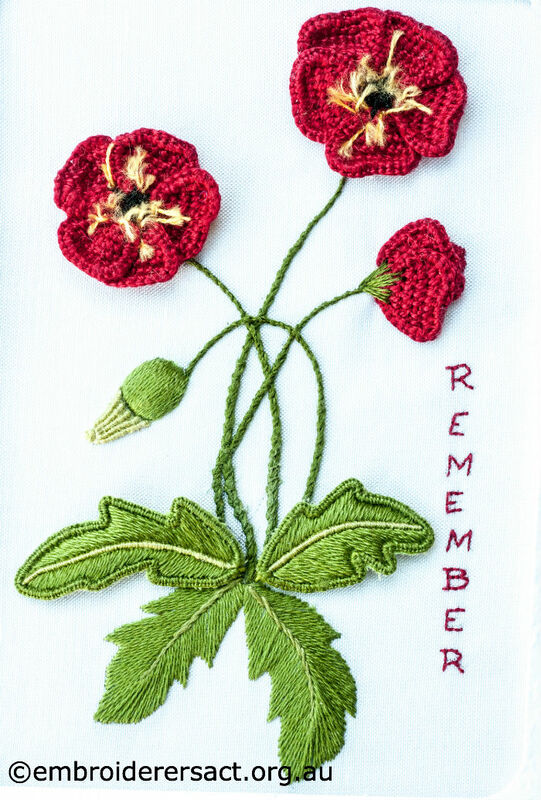 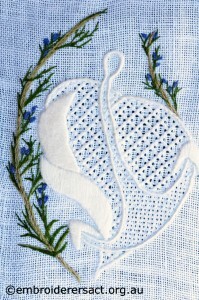 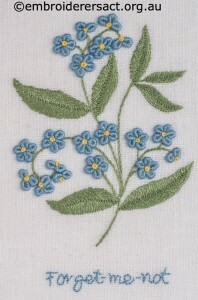 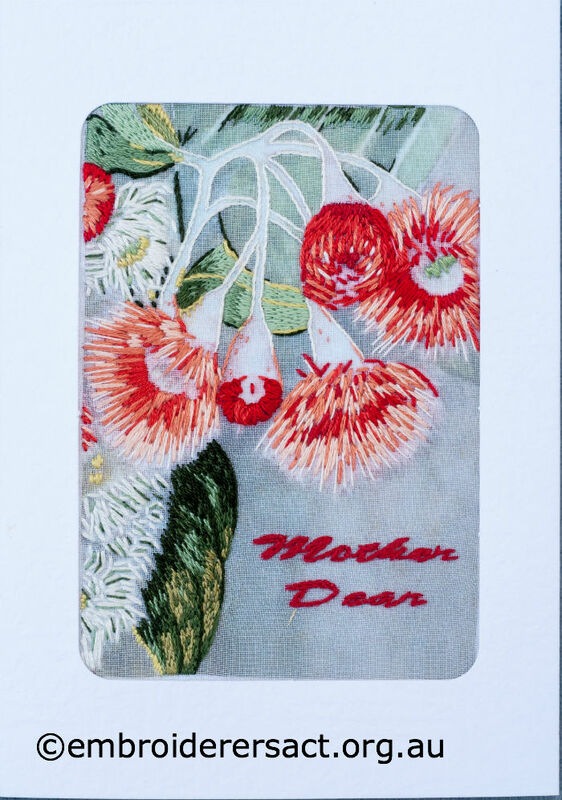 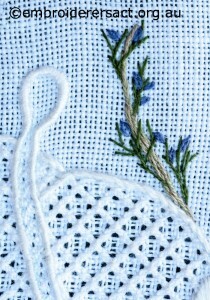 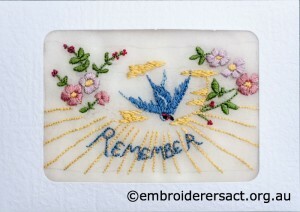 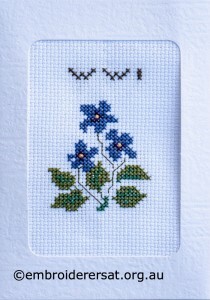 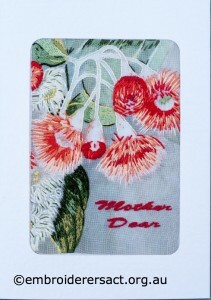 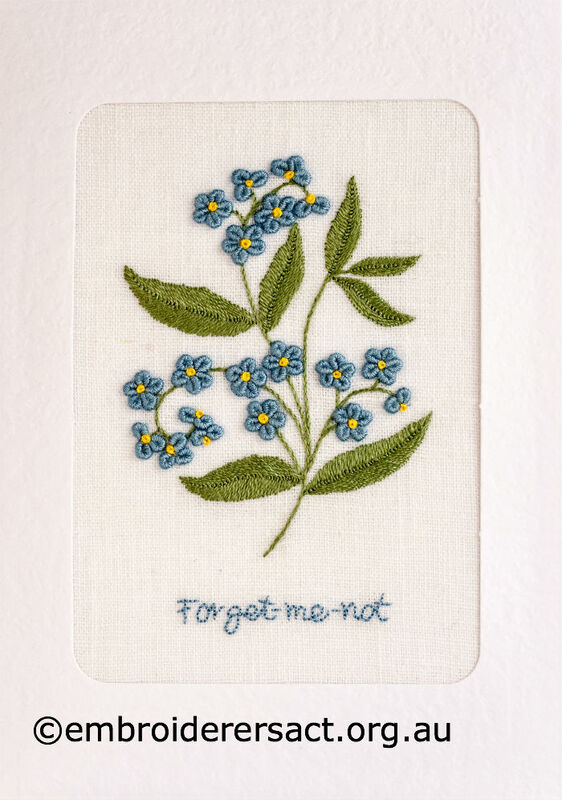 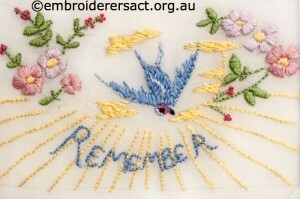 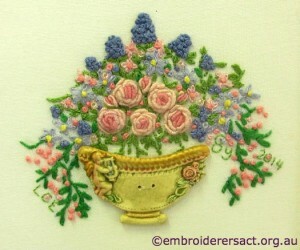 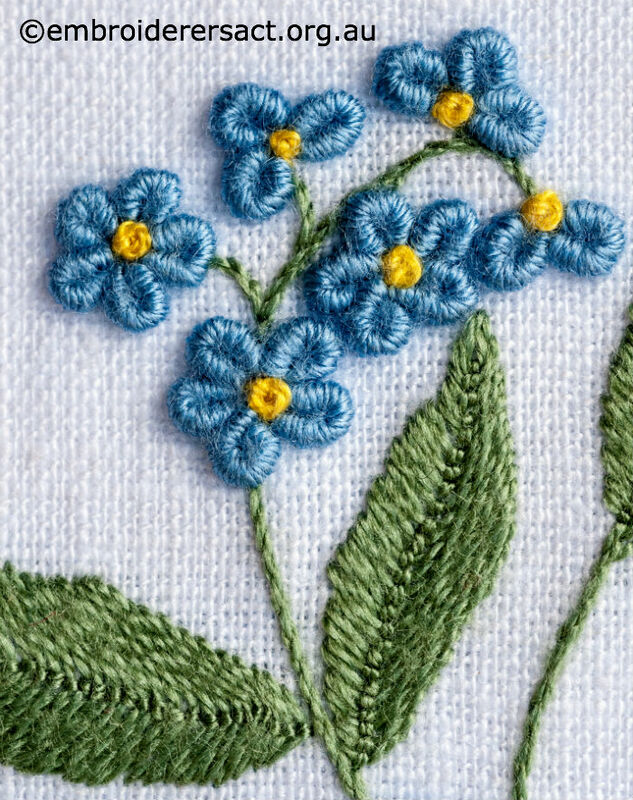 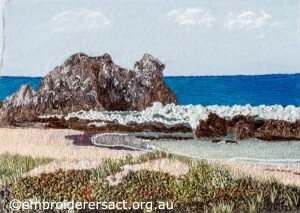 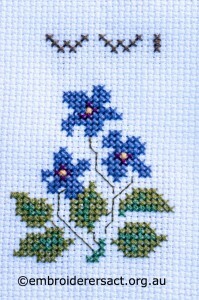 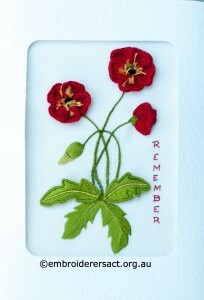 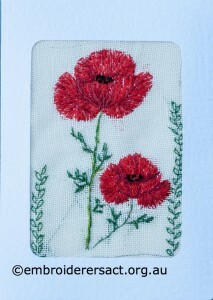 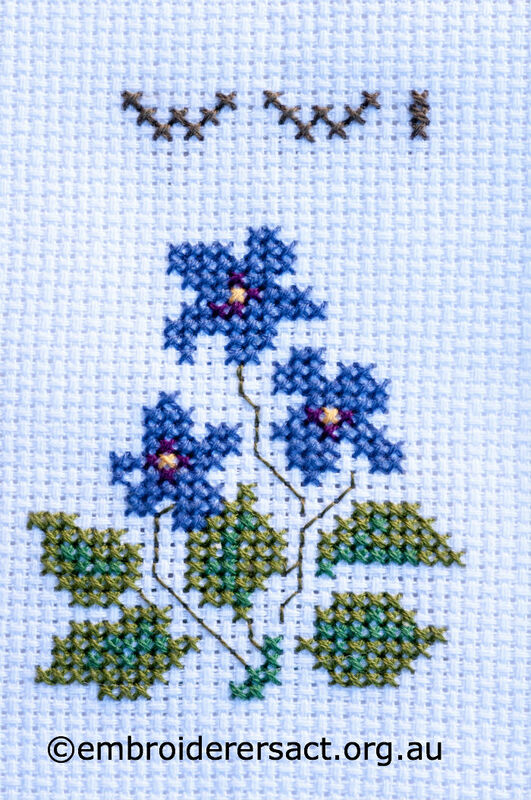 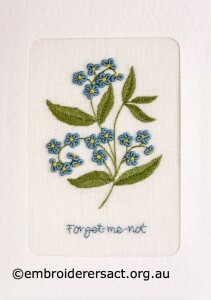 This postcard was stitched by Dorothy Brann and honours her grandfather. 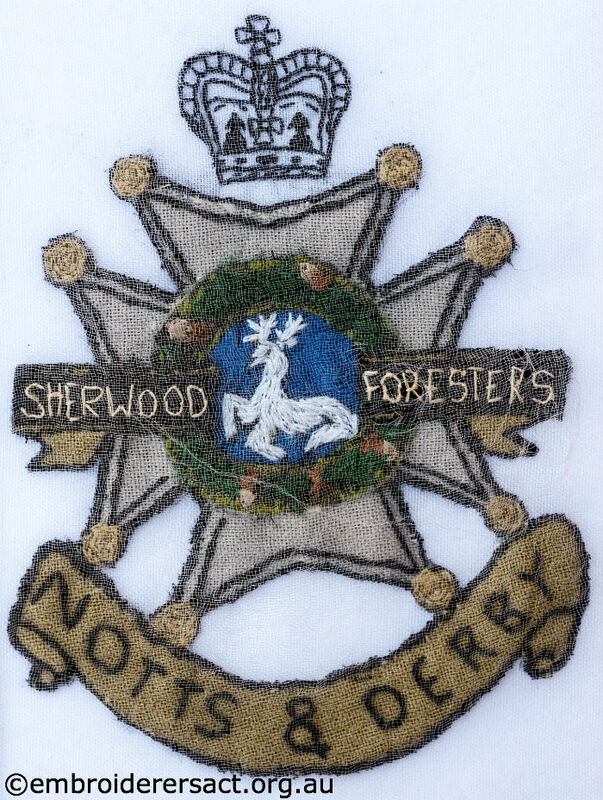 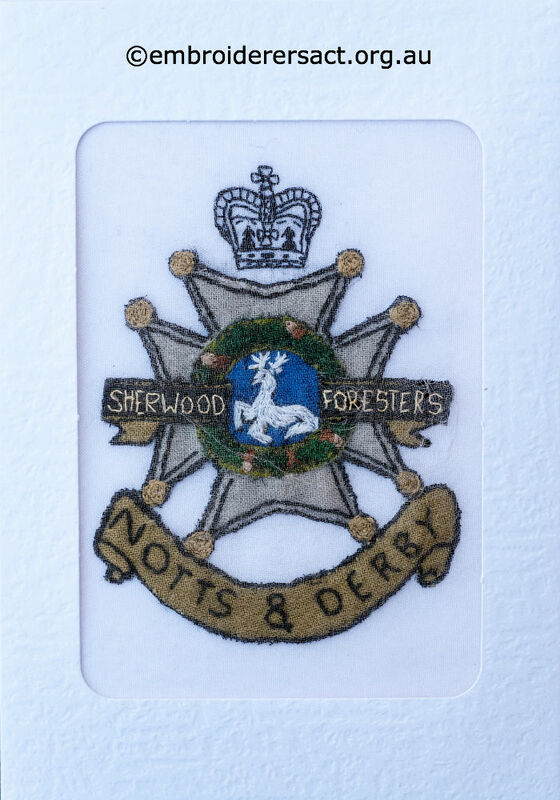 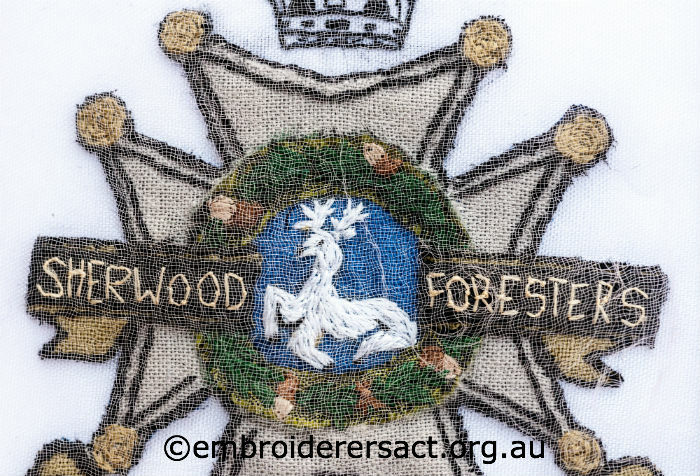 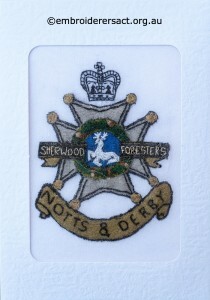 The symbolic elements on the badge include the Maltese Cross, an oak wreath and a white hart (large male deer). This postcard is deeply personal, evocative and very moving. 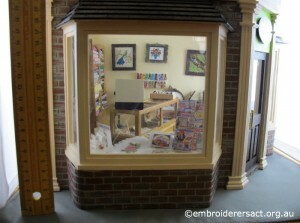 The new photos are at the top of each gallery so that you can see what’s new easily. 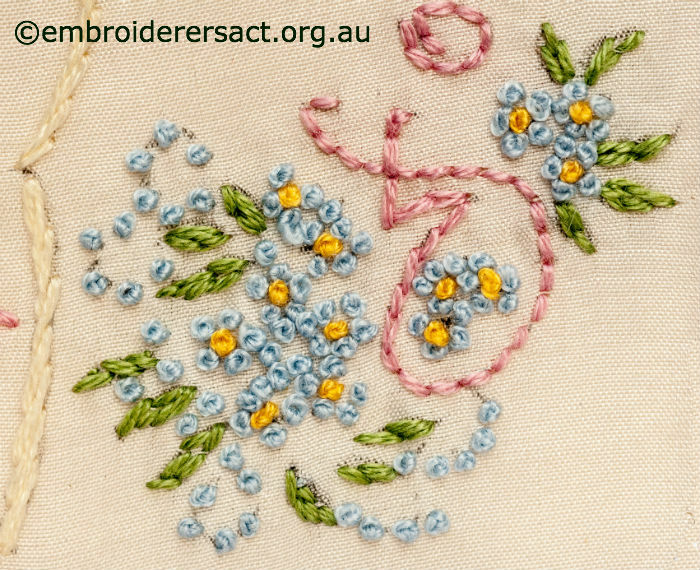 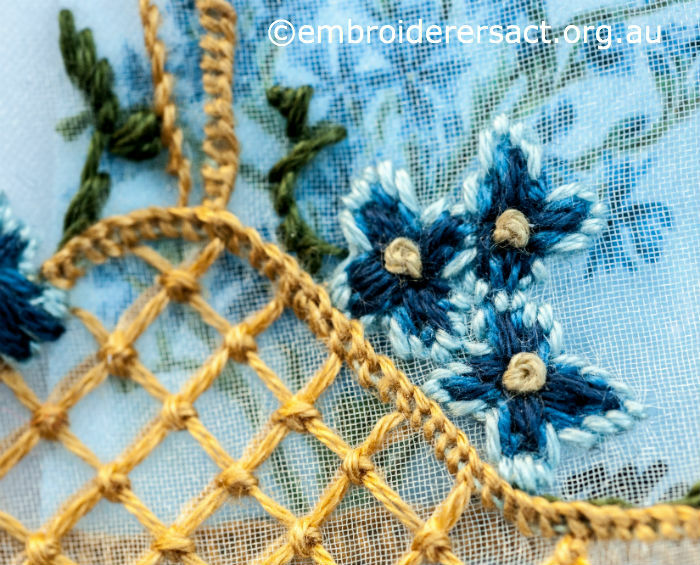 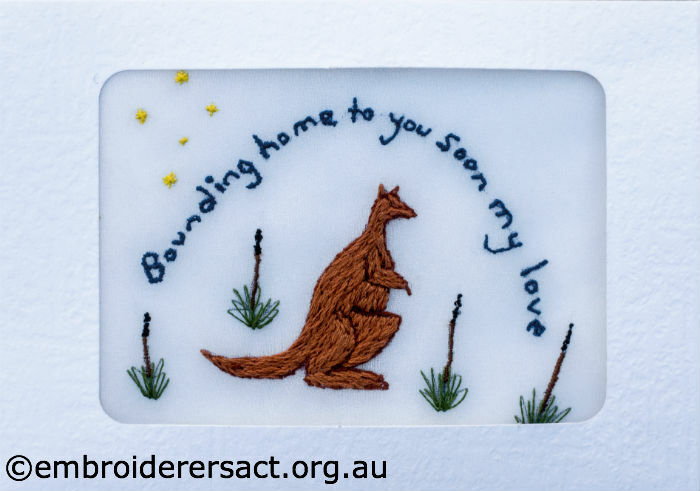 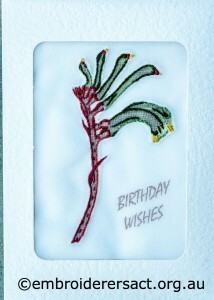 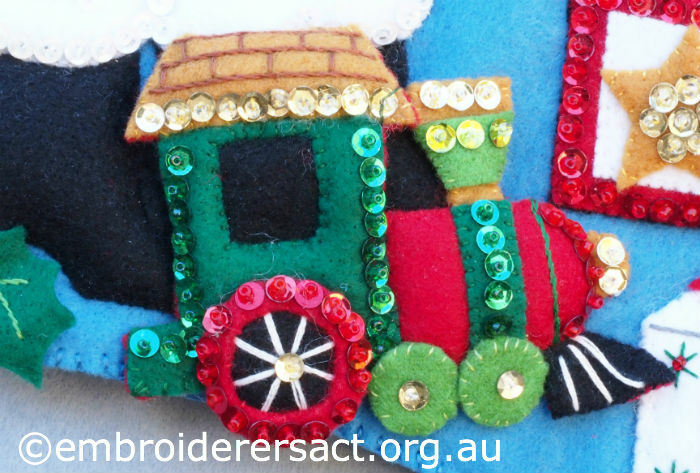 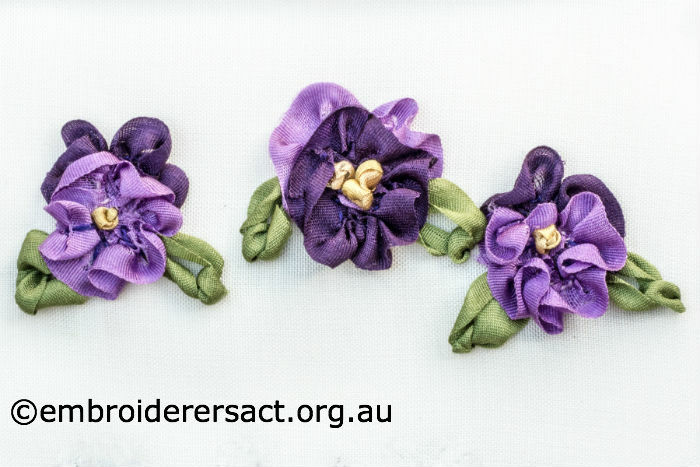 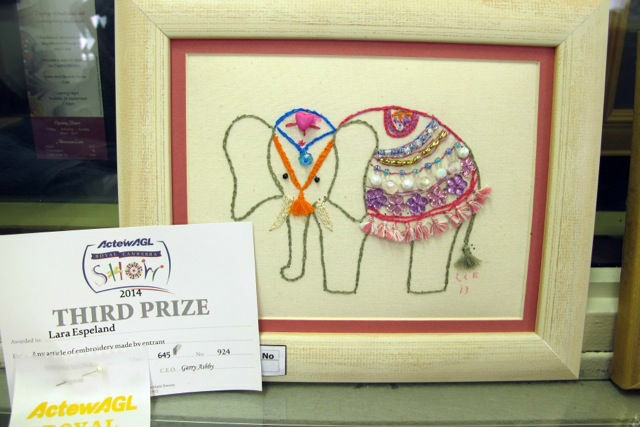 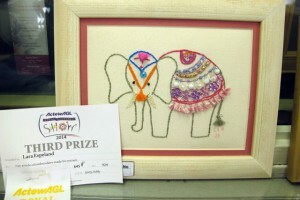 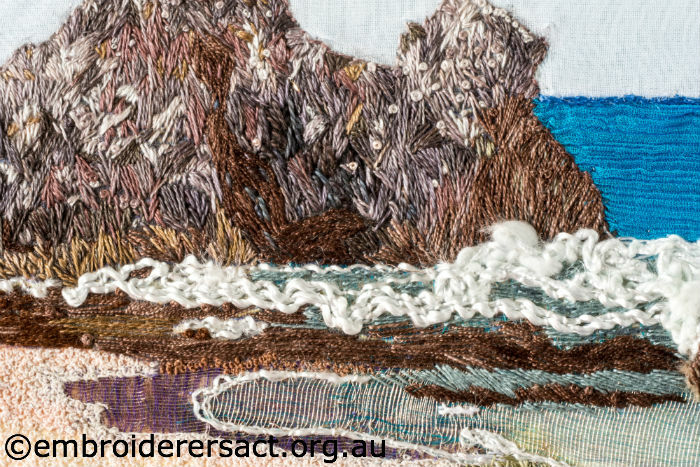 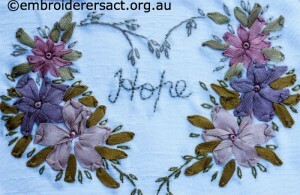 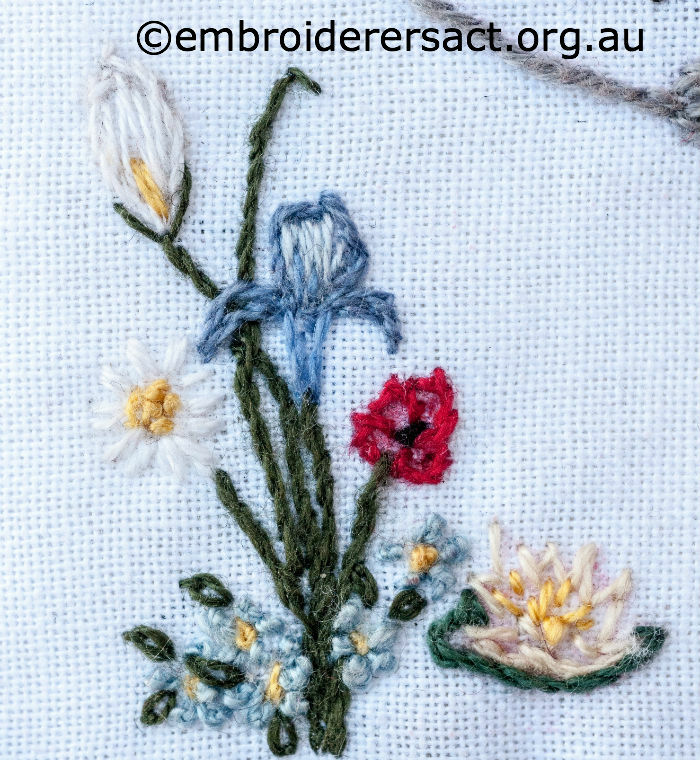 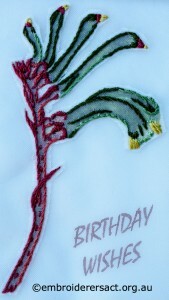 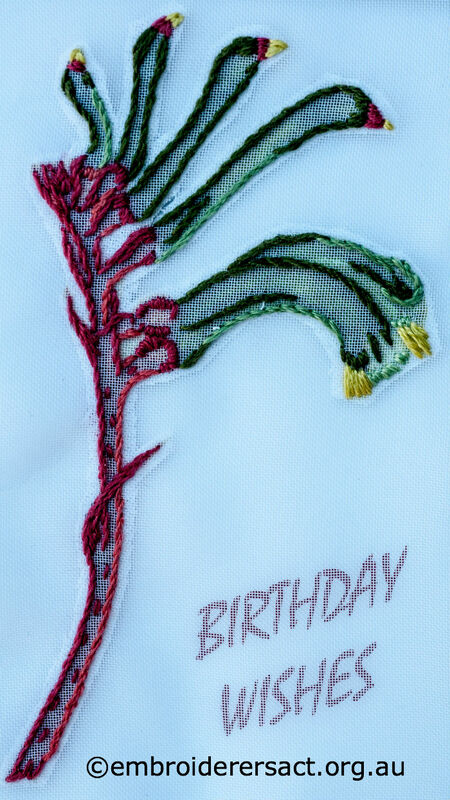 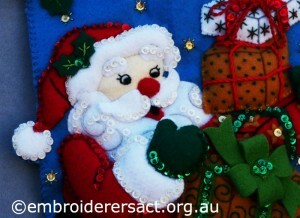 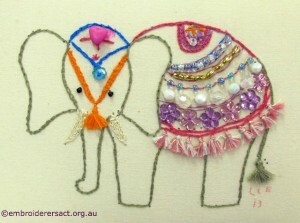 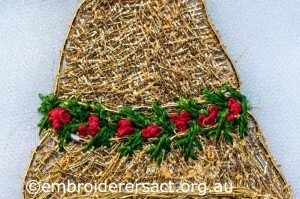 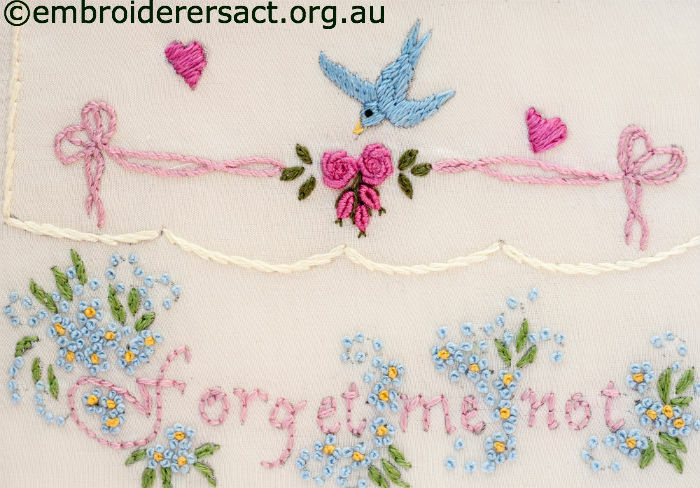 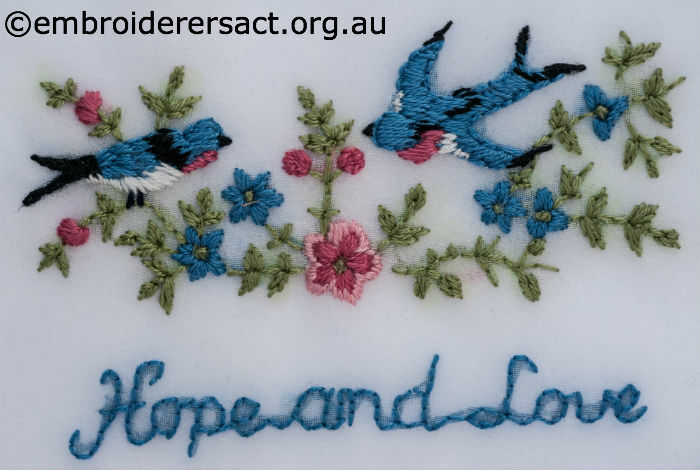 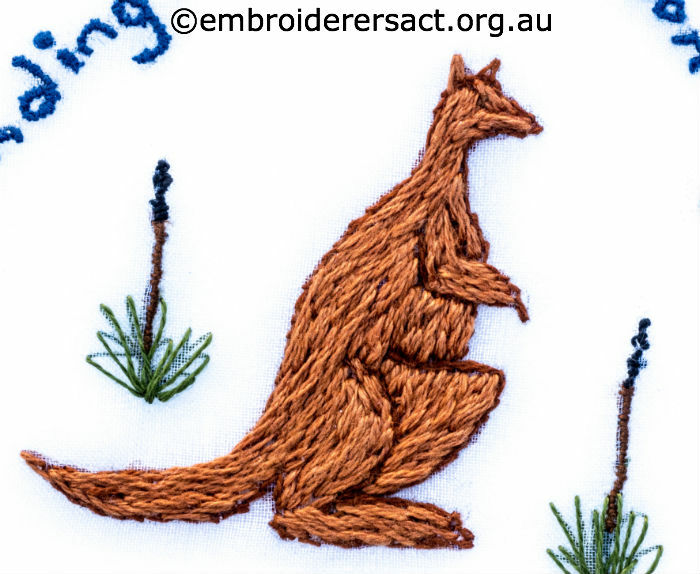 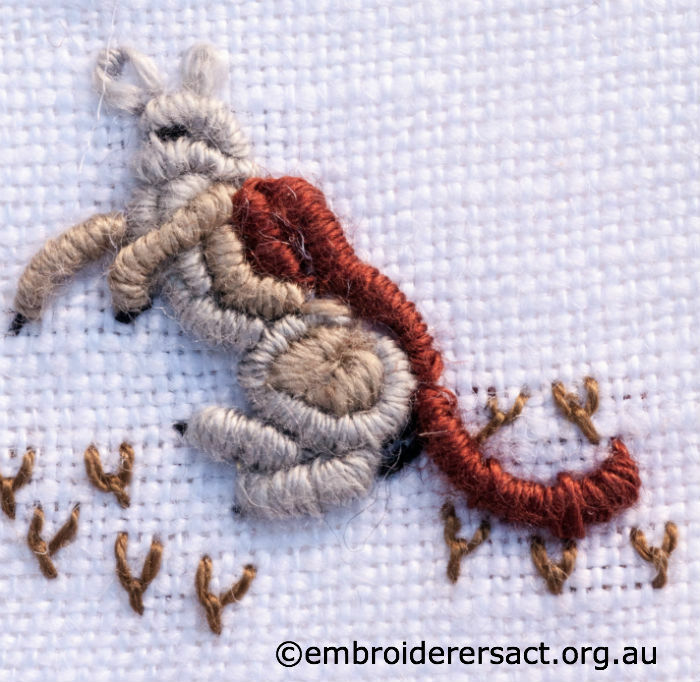 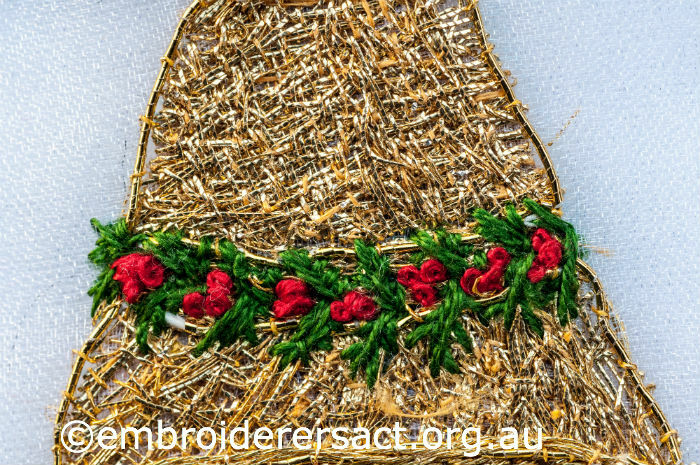 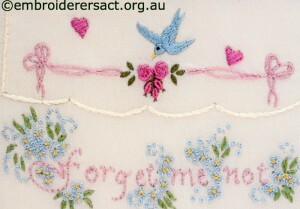 One of our Young Stitchers Lara is 8 and she entered some of her beautiful embroidery in the Canberra Show. 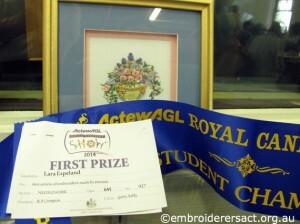 But there’s more – she won Student Champion!!!! 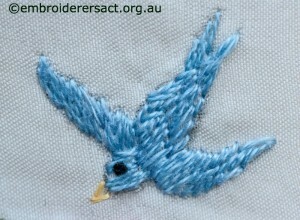 How awesome is Lara’s stitching?!!! Those grub roses are just so cool! 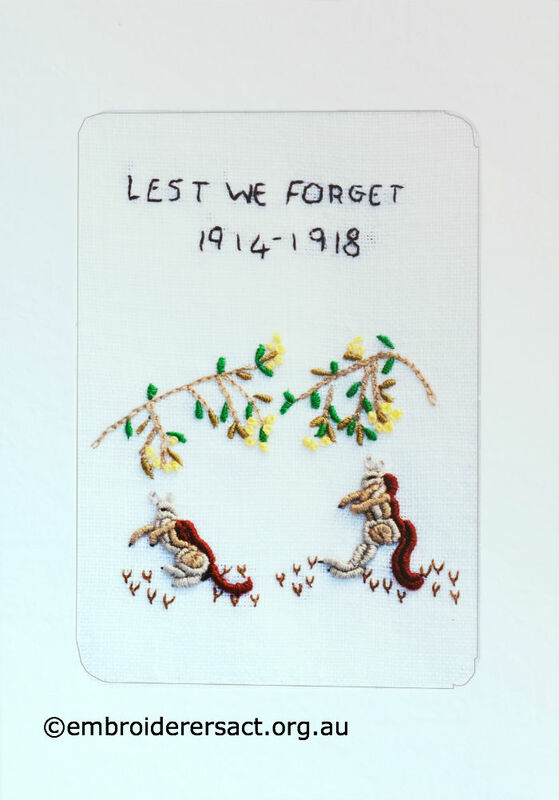 Just a head’s up about two of the wonderful special features of our 2014 Exhibition which will be held from 18-21 September at the Albert Hall. 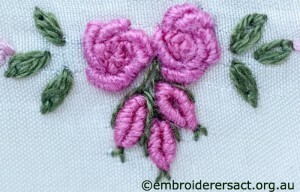 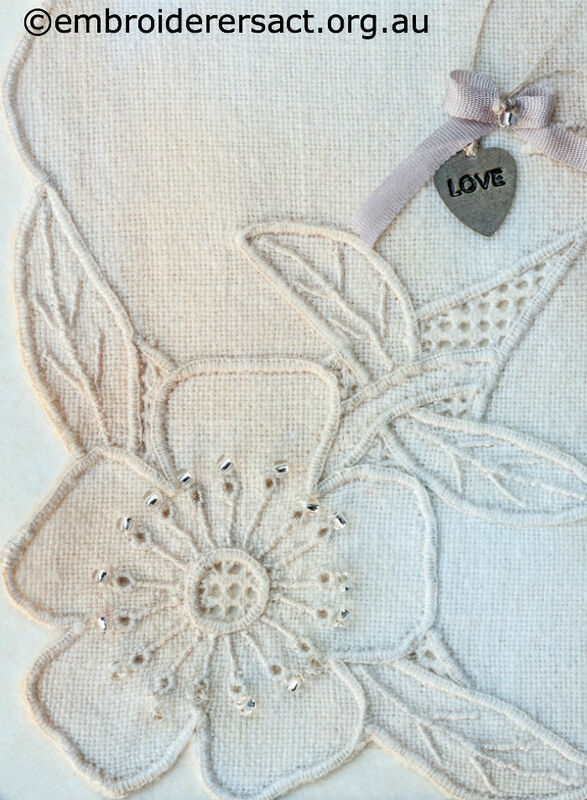 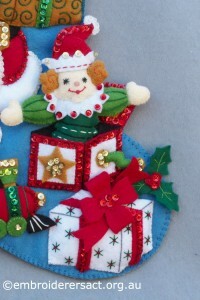 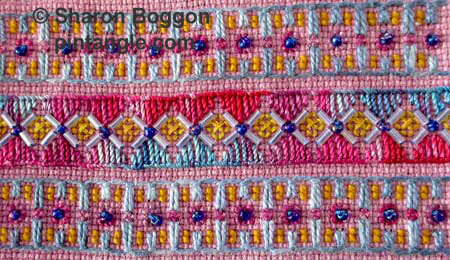 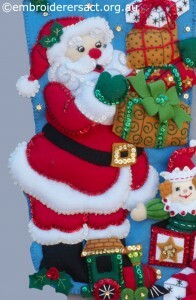 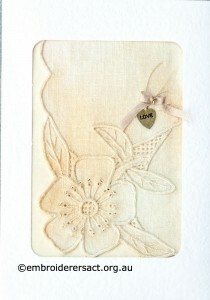 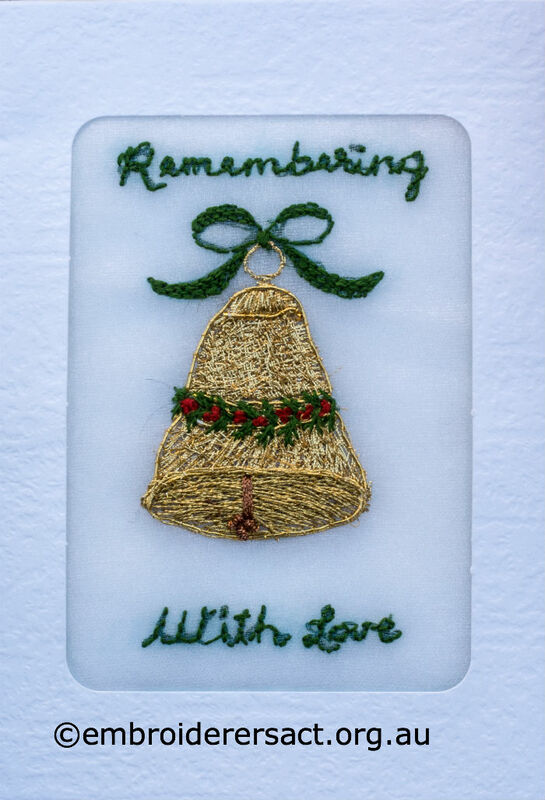 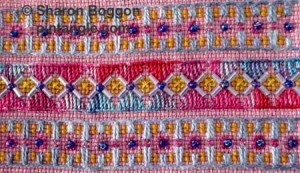 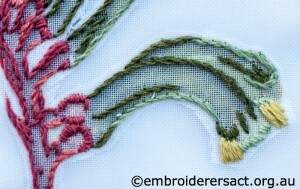 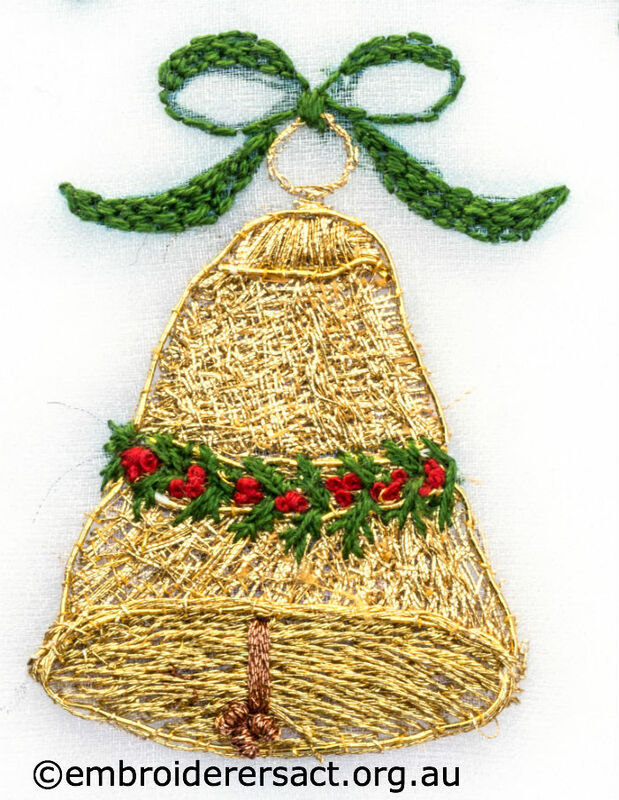 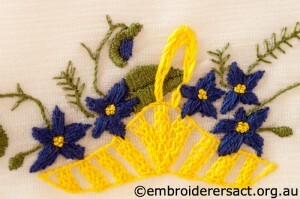 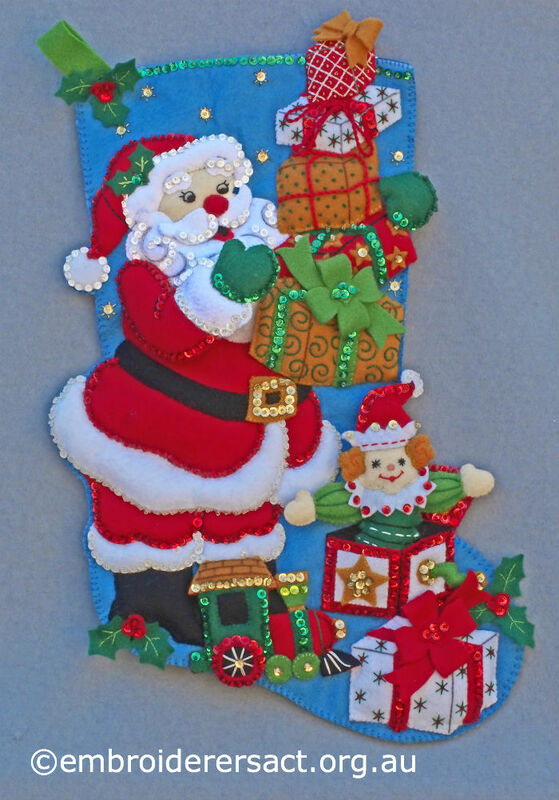 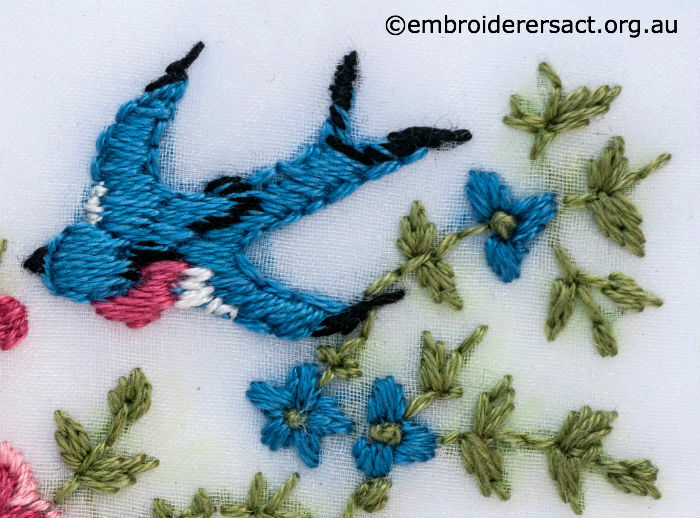 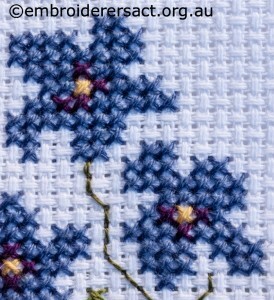 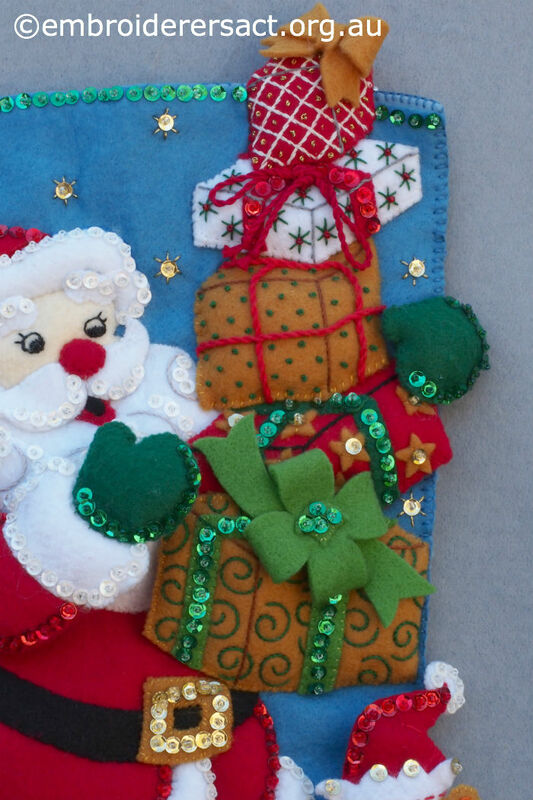 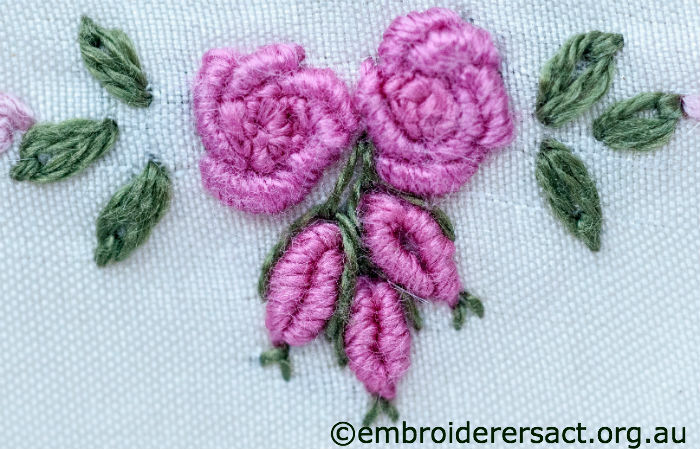 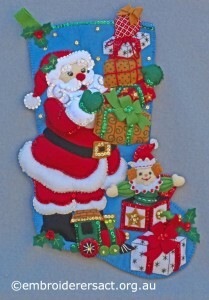 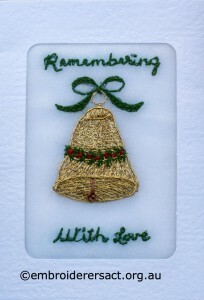 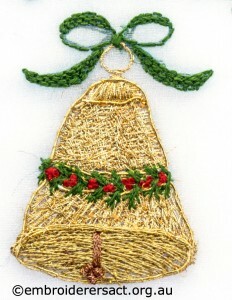 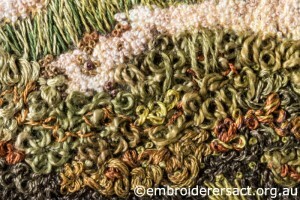 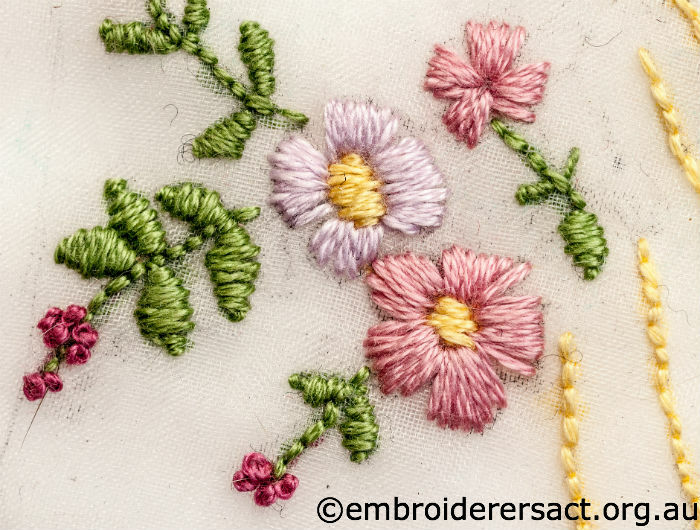 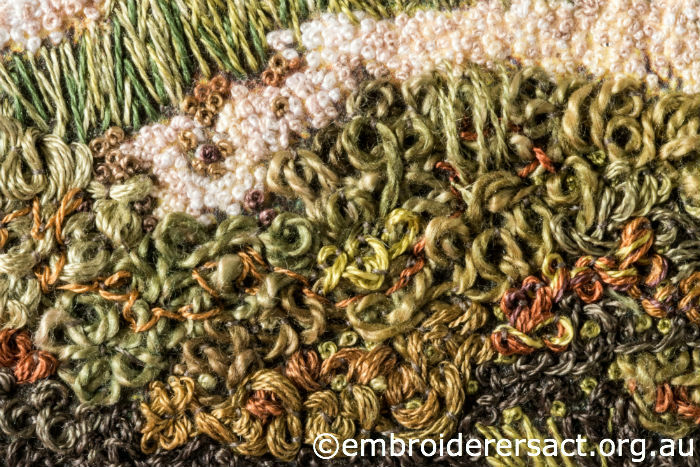 If you’re a fan of Sharon Boggon’s Pintangle blog then you’ll know all about her Love of Stitching Band Sampler. 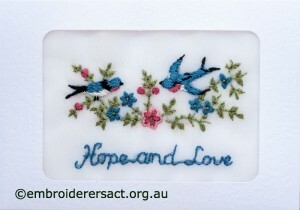 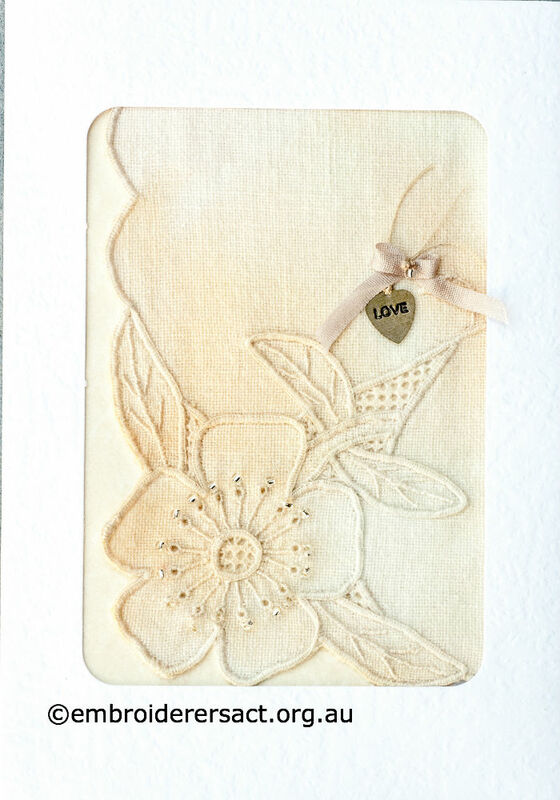 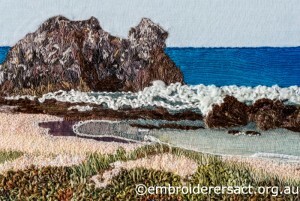 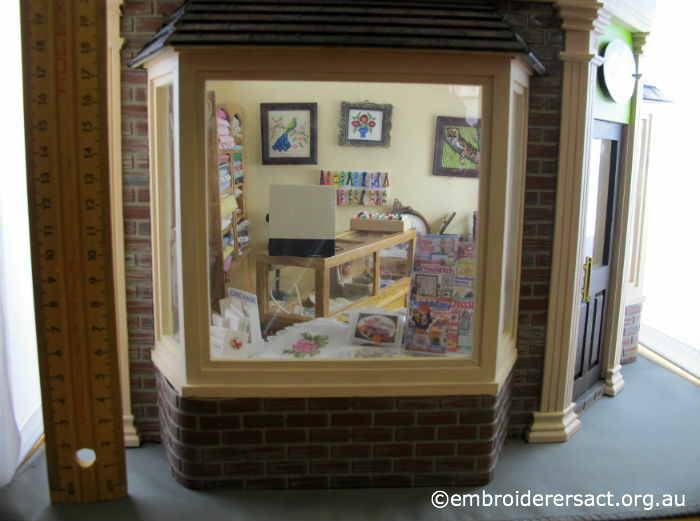 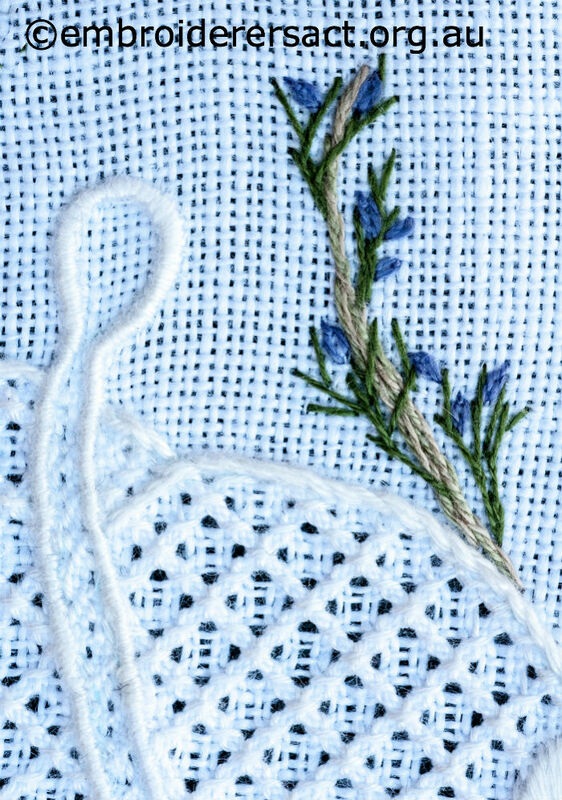 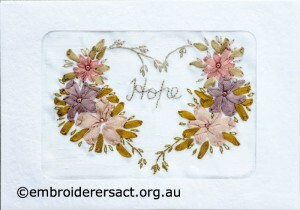 And top of this there’ll be the curated exhibition of the postcards in the Stitching Love and Hope Challenge – Can’t wait!! 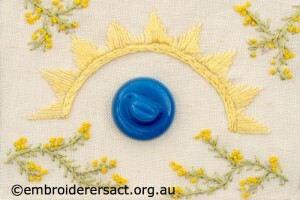 The Queensland Guild has a bright new website with a real pop of colour here and a new Facebook page here. 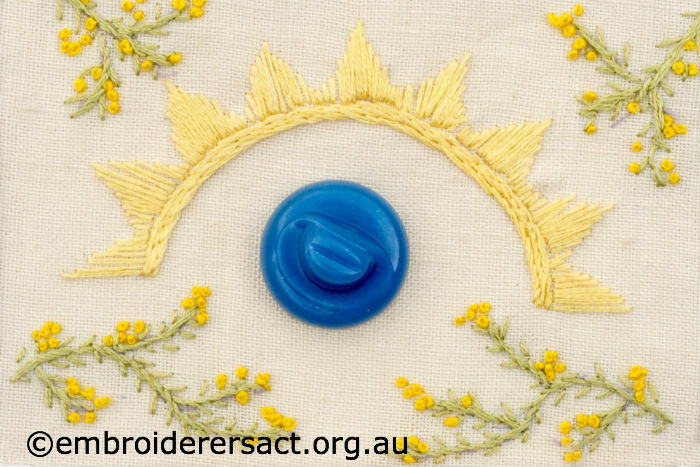 So go have a look and if you’re on Facebook then you might want to ‘like’ their site – it’s really important to support our fellow Guilds.